Hometown: I was born and raised in Deer River, Minnesota; located 100 miles south of the Canadian border with a population of 900 people. 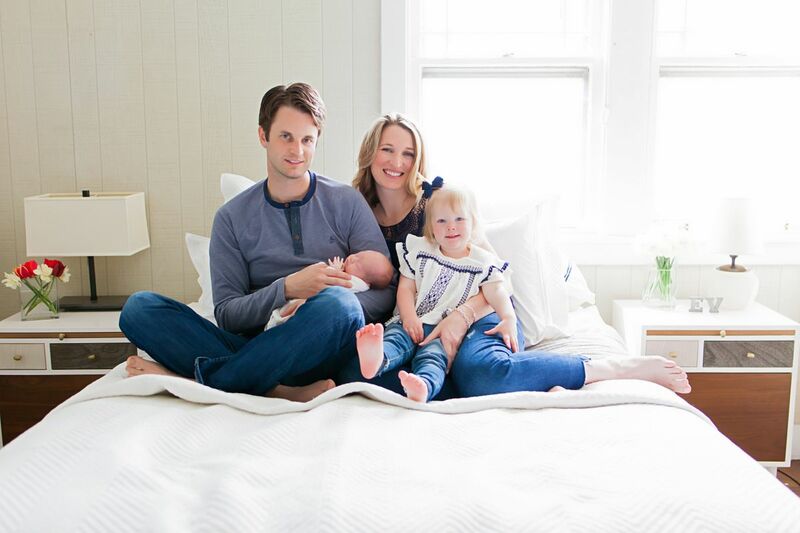 Tell us about who is in your family: My handsome and handy husband, Joel, and our amazing two daughters, Everly (30 months) and Vivian (4 months). Current/Previous career: I work for a privately held real estate developer and manage luxury rental apartments. I specialize in opening new construction buildings, from working with the architecture and design teams, to hiring and training the building staff, to leasing the units, and to providing exceptional customer service to the residents who call the building home. I currently am in process of opening our newest location, which will open three weeks after me returning from maternity leave. What was your childhood ambition? Growing up in a small town in a family of five daughters, I always knew I wanted to live in a big city as a successful working mom and business woman. As hectic as life can be, it is enlightening to realize now that I am actually "living my dream"! What does motherhood mean to you? Motherhood means living the life that would make not only myself, but also my mom and daughters proud. Bringing two little girls into the world has made me realize that these girls look up to me and they are an exact reflection of my actions and attitude. While Vivian was in the hospital, one of her nurses shared one of the truest sentiments with me that I feel sums motherhood up perfectly: "The days are long but the years are short". What is the furthest you have been away from home? My husband and I honeymooned for ten days along the Adriatic Coast and the Dalmatian Islands. How did you find FIT4MOM? While pregnant with my second born daughter, Vivian, I spent 9 weeks on bedrest in the hospital. I spent more hours than I would like to admit looking at facebook during this time. I came across an ad for Stroller Strides opening in Elmhurst during one of these scrolling sessions and was connected with Caitlin and Amanda, who not only encouraged me to try a class when I was ready, but also provided sincere support and encouragement during my period of bedrest. How as FIT4MOM changed your life? FIT4MOM could not have entered my life at a more perfect time! Between being in the hospital on bedrest and Vivian in the NICU (she was born eight weeks early), I had spent a total of 100 days in the hospital. To say I was ready to start working out again (okay being active in any way!) and socializing would be a complete understatement. At the same time, I was anxious how I would be able to balance taking care of both my toddler, Everly who was beyond excited to have me home and my preemie daughter, Vivian, was just released from the NICU and still seemed so tiny and fragile. I knew FIT4MOM was exactly what my daughters and I needed shortly into the first class I attended, taught by the fabulous Lesley Lehman. It gives me the opportunity to be physically active, my daughters the opportunity to play with new friends and to see their mom as a healthy and happy role model, and opened all of our eyes to a network of inspiring women who are kind, active, and positive. This year has really taught me that parenting really does take a village and the FIT4MOM Village is one that I am so honored to be a part of. I also was pleasantly surprised that Stroller Strides is an actual workout. Having worked with personal trainers before, Nicole is one of the best and we are lucky to have her in Elmhurst! I became hooked and had to tell my other mom friends of this mom win, who quickly joined as well. Favorite exercise: It changes often based on whichever exercise I see or hear Everly copying. I often hear her singing herself to sleep with the Popcorn song. I also love when Nicole brings the mini bands to class. Proudest moment: I experienced PPROM (preterm premature rupture of the membranes) with my second pregnancy. My water broke at 23 weeks while pregnant with my second daughter, Vivian, earlier this year. Upon arriving at the hospital and seeing various nurses and doctors, I was told to prepare for imminent delivery and statistically that I would likely deliver within a maximum of 72 hours, as do 97% of women who experience PPROM. I subsequently spent 61 days living in the hospital on bedrest, beating all the odds, until I gave birth to our beautiful baby girl. Vivian was born eight weeks early and is now four months and thriving. Tell us something about yourself that would surprise us: I commute to the city every day for work and ride a moped to the metra station and ride a Divvy bike from Ogilvie to my office every day, even in winter sometimes!